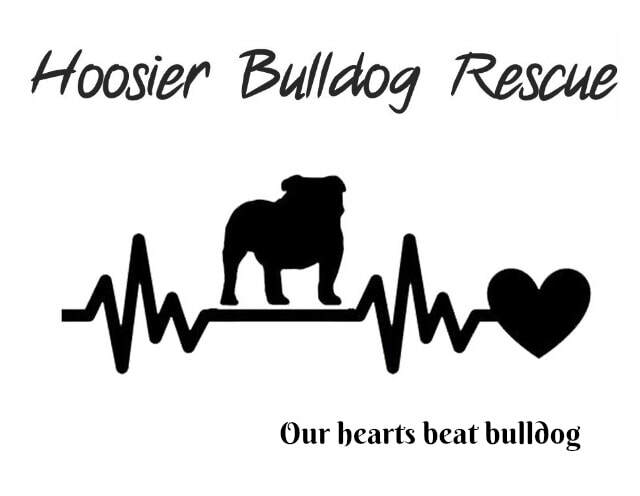 Welcome to Hoosier Bulldog Rescue! ​We are answering the call of bulldogs! You cried out and we heard - we are here to be an avenue of resources, education, and rescue for bulldogs and bulldog families in Indiana. Our founders and board of directors are experienced rescuers who have the passion, knowledge and networking to help bulldogs in need. We have each been involved in rescue for years - serving on board of directors, volunteering, and fostering for several other rescue organizations. Recently we have come together to share our dreams and goals. We have been working closely with Illinois English Bulldog Rescue, who had stepped up and rescued nearly a dozen bulldogs in need from Indiana. We appreciate their guidance and mentoring during the process of forming HBR. We will continue to work with them and fellow rescues throughout the country. We have recently received our 501c3 status and we are beginning our fundraising activities. We know that we need to have a strong base of volunteers and foster homes in place in order to be successful. We will always strive to appropriately and properly place dogs in the best possible environment for both the dog and the family. Our top priority is the successful match of our rescued bulldogs to ensure their health and happiness. ​But in order to do this we need to build our rescue team! Which means, we need you! We need your ideas, your input, and your involvement. We need your brain power, your muscle, your passion. We need YOU! ...then join our rescue squad! Please take some time to look over our website, fill out a volunteer form, send us your ideas, get the word out, help us save the world one bullie at a time!